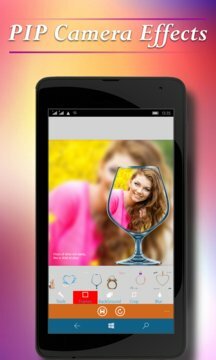 PIP Camera Effects with stunning pic-in-pic photo effects where you can combine your blurred photo and creative photo frame. PIP Camera Effects app allows you to make your photo in glass, watch, camera, and more. Classic and the most fashionable PIP Camera app. You can add awesome effects, stickers, cool backgrounds as well as stunning filters. Create extra fun photos with this amazing photo editor. No Crop Images for social media - You can post full sized photo on Instagram, Facebook and Twitter without cropping. All the filters you will find here are so unique that you will fall in love. Download now and start using Pic in Pic effects or picture in picture effects now.